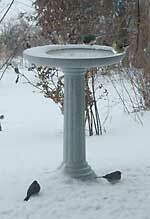 This morning it was zero degrees, and the birdbath heater couldn't quite keep up. Birds landing on the edge had to walk to the open water in the center. Bluebird didn't seem to object. 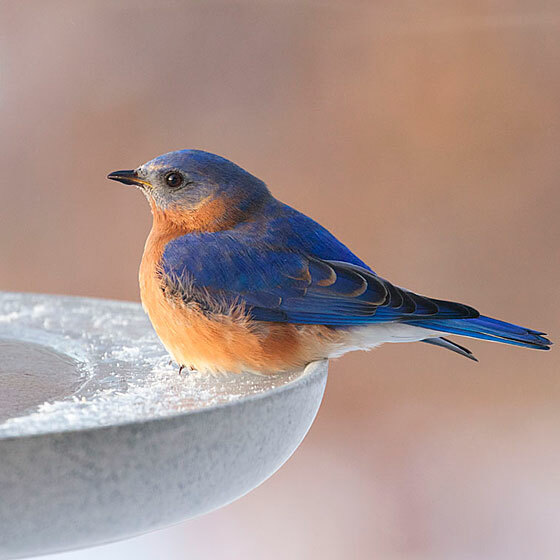 Eastern bluebirds do winter in Iowa, the hardy ones, anyway, as recluses of the woods. In this season they don't often come out in the open. Today a need for wet water must have brought this one to the bath. Such a reward I had for keeping a little water melted in my back yard. 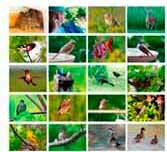 Our birds love it. The bluebird at left is using the Kozy Bird Spa at Birdwatching Dot Com.